Join us in our Bible memorization challenge. Memorize one verse a week one year. If you take the challenge you will commit 52 verses to memory by the end of the year. This week we look at the fourth verse from the Beatitudes, the introduction to the Sermon on the Mount. Hunger and thirst are powerful forces. They are all consuming. When you are truly hungry and thirsty, there is not much else you can think about. Everything you do is about satisfying those powerful desires. As believers, we recognize our righteousness is found in Christ. We are not going to achieve righteousness on our own through our effort. Ultimately, the desire for righteousness will lead us to Christ where we find our true satisfaction. There is nothing we will find in this world that will bring us greater satisfaction. This is our third verse of the week from the Beatitudes in the Sermon on the Mount. Our memorization challenge is to memorize one verse a week. If you memorize one verse a week that will be 52 verses you will have memorized over the course of a year. In this verse, Jesus says blessed are the humble. The opposite of humility is pride. Pride keeps us from recognizing the need for our Savior. Pride creates conflict in relationships. It is hard to live in pride. There is the constant need to live up to “our reputation” and prove ourselves to others. Pride keeps us from being authentic. We are forced to put on a face. Pride is continually demanding of us. But humility is the ability to let go. We are able to live in a place of dependence upon God rather than ourselves. There is no need to prove ourselves or to live up to the expectations of others. Humility brings freedom. Humility puts the burden upon Jesus rather than on ourselves. 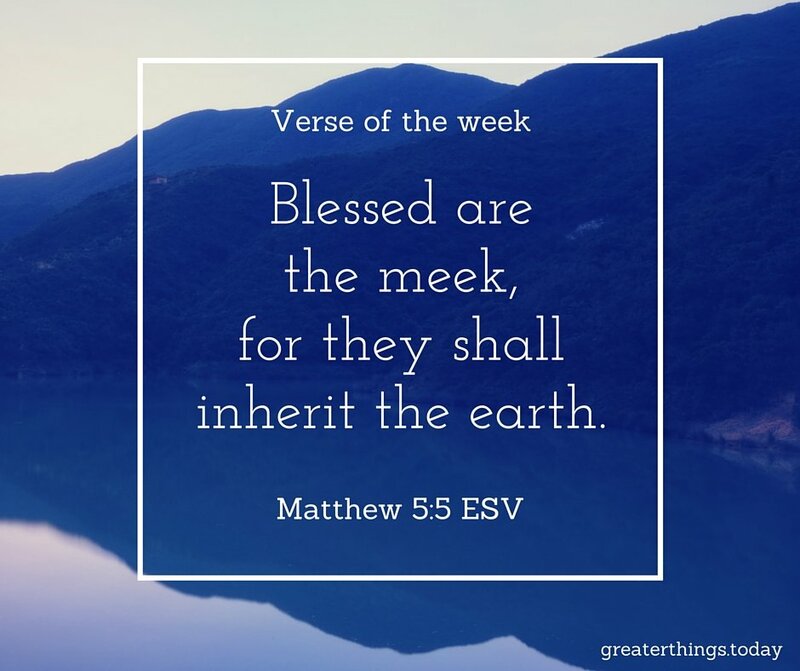 Our verse of the week this week is Matthew 5:4. It is the second Beatitude in the Sermon on the Mount. We want to encourage you to memorize this verse together with last week’s verse. By the end of ten weeks, you will have all of the Beatitudes memorized. Print this verse out. Put it in a place you will see it. Set an alarm on your phone at a certain time of the day. Use the alarm to help remind you to call the verse to memory. In this verse, Jesus says, “Blessed are those who mourn.” It goes against what we might think to be true. We don’t equate mourning with blessing. But the way of Jesus is not the way of the world. Those who mourn recognize their need for the Savior. They will call out to him for help. Many of us are too proud to ask for help. We silently suffer. We convince ourselves everything is okay when it is not. But continue to struggle while holding back the tears. The beginning of getting help, is to ask for help. It is to make your hurt known by crying out. So indeed, blessed are those who mourn for they are comforted! As you reflect upon this verse, where are you hurting and where do you need to ask for help? Each Sunday we will post the verse of the week. The purpose of this verse is to put it to memory. Write it down. Put it in a place you will see it regularly. Reflect on the verse and its meaning. How can you apply this verse to your life each day? We are starting with the Beatitudes from the Sermon on the Mount. We will take one Beatitude a week for the next ten weeks. By the end of that week you will have the beginning of this sermon memorized.